ChromaFlair | VIAVI Solutions Inc. Created using a revolutionary thin-film technology, each flake exhibits a wide range of hues depending on the angle at which it is viewed and the angle of incidence of light—a dramatic color shift that is even achievable in low-light environments. Highly chromatic, durable and easy to incorporate, ChromaFlair pigments can add value and appeal to virtually any product where color is a key differentiating factor. Seven standard colors are currently available and their names reflect the color seen at approximately 0° and 45° respectively, the number represents the pigment’s approximate hue at normal viewing angle. 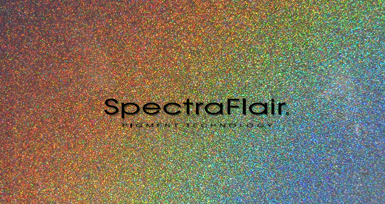 ChromaFlair pigment is a unique material consisting of an ultra-thin, multi-layer interference film that forms micron size flakes. Unlike ordinary and many special-effect pigments, ChromaFlair pigment is opaque, thin, flat, and highly specular (mirror-like). ChromaFlair pigment is manufactured by the deposition of ultra-thin layered structures similar to those sometimes found in nature, such as soap bubbles, butterfly wings, or sea shells. Precisely controlling the thickness of the multi-layers in the pigment’s flake structure produces different colors. To maintain tight color tolerance, the layer thickness must be controlled to within a few atoms. The color of ChromaFlair pigment is the result of a thin-film interference phenomenon. The color of ChromaFlair pigment is generated when the material’s layered construction causes interference of light waves. Due to the high flake-diameter-to-thickness ratio, ChromaFlair pigment has excellent leafing properties, thus creating a high level of specular color. Because of these properties, the colors of ChromaFlair pigment are highly saturated and bright.